"I chose the name Alpine for my firm because this adjective represented for me the pleasure of driving on mountain roads. It was by navigating the Alps in my 4CV that I had the most fun. It was this enthralling sense of control that I wanted customers to find at the wheel of the car I wanted to build. Alpine is a name which sounds good, it is also a symbol." Jean Rédélé, a Renault dealer in Dieppe, began to participate in motor racing in a carefully prepared Renault 4CV. He started with a victory in the prestigious "Mille Miles (Thousand Miles) across Italy. He repeated this achievement two years in succession. Rédélé, a former pupil of Hautes Ecoles Commerciales and ex-pilot, manufactured in his garage a car with such revolutionary aerodynamic styling that it caused a sensation at the Salon de l'Auto. It was the birth of the first A106 which was called Alpine in memory of JeanRédélés victory in the Coupe des Alpes of 1953. The first Alpine was marketed. It was a two door saloon made of polyester mounted on a Renault 4CV chassis. Production soon became more organised and diversified with sports coupe and cabriolet versions produced. Appearance of the convertible A 108 which preceded what would become the Berlinette a few years later. At this time the production of the company "R.D.L." was 180 vehicles per year. A turning point in the history of Alpine. The launch at the Salon de l'Auto of the Berlinette "Tour de France" which, for nearly 17 years, gained victories in all the well known races and made the name of Alpine Renault renowned and admired throughout the world. 7176 examples were produced in total. This year saw the appearance of the A110 derived from the A108. This car benefited from the R8 engine which greatly contributed to its success. At the same time, Alpine planned an attack on greatest race of endurance in the world: Le Mans 24H. The prototype M63 was built: Chassis and suspension derived from Lotus. R8 engine modified by Gordini. In addition there were various victories in rallies and F2 and F3 single seater races. Birth of the competition and racing division. Although it had very limited means, the division produced very encouraging results, to such an extent, that at the end of 1967 Renault decided to give its full support and entire racing budget to Alpine. Very quickly, it gathered together a team of 60 impassioned people. The production of the Berlinette continued to grow, the competition and racing division broadened in scope and Alpine A310 was being planned. As a result it was decided to move the Alpine team to a new factory located in the industrial park of Dieppe. This year Alpine decided to stop the manufacture of prototypes and did not recommence until 1973. This year was a remarkable one for Alpine. It saw the launch of the four cylinder A310 at the Geneva Motor Show. This 2+2 coupe was designed to reach a wider audience than that which, until now, had been interested in the Berlinette. In competition, Alpine, achieved a place in the history of the Monte Carlo Rally with 3 cars in the first 3 places: Andersson preceeding Thérier and Andruet. In Formula 3, the four team mates, Depailler, Jabouille, Leclère and Serpaggi drove their Formula 3 and Formula Renault single-seaters to become Champions of France in their respective classes. Alpine dominated the Monte Carlo Rally with 5 official cars finishing in the top 6: Andruet 1st - Anderson 2nd - Nicolas 3rd - Thérier 5th - Piot 6th, repeating the 1, 2, 3 of 1971. Driven on by this success the Alpines won 6 more victories culminating in their first World Rally Championship title. After winning the World Rally Championship, Alpine and Renault, having nothing to prove in rallying, concentrated their efforts towards building prototypes, the goal of which being victory at the Le Mans 24 hours. This led to the production of theA440 and then the A441 which was driven to victory by Alain Serpaggi, winning him the title of European 2 litre Champion . 1973 saw an increase in Renault's holding in the company. 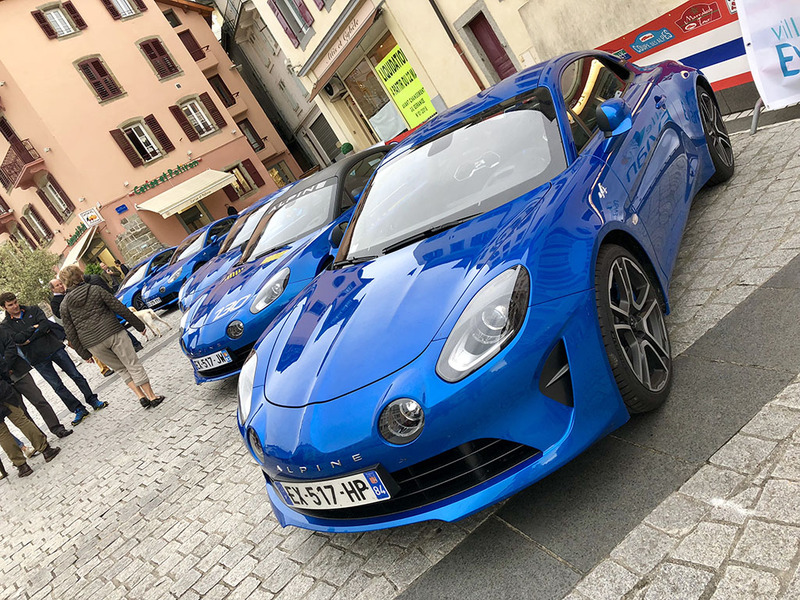 They entrusted Alpine with the manufacture of the R5 Alpine whose success largely exceeded even the most optimistic forecasts. In 1976 the new Alpine A310 with the V6 engine appeared. This was the car people had been waiting five years for. This new engine, fruit of a collaboration between Peugeot, Renault, Volvo, made it possible for the A310 to compete with cars of the same standing. A chapter in Alpine history closes. After 17 years of good and faithful service, it was decided to end production of the Berlinette. Her big sister, the A310, took her place and with Guy Fréquelin as driver, won the French Rally Championship. In the Le Mans 24 hours, the A442 B 2 litre Turbo, driven by J-P Jaussaud and Didier Pironi, gave Alpine the victory they had waited 15 years for. At the same time, there was a sharp increase in the production of the R5 Alpine. The workshops had reached saturation point and the manufacture of R5 Turbo was already being planned. As a result the year saw a complete reorganisation of the workshops. The most spectacular modification was the paint shop which grew from 1150 m² to 2560 m², and became a line comprising 2 tunnels, one for primer and one for lacquer. These transformations brought improvements in quality and time (20%) and the possibility of production of 60 vehicles a day instead of 7. Renault decided to divide the company Renault Sport into 2 departments: 1 in Antony in charge of the preparation of rally cars and 1 in Viry-Chatillon in charge of the preparation of F1 cars. 1980 saw the birth of Turbo Renault 5. Powered by an engine derived from the R5 Alpine, but fitted with a turbo charger and developing 160bhp, it very quickly took its place at the top of the league of the new generation of hot hatches. First victory for a turbo charged engine in a trial for the World Rally Championship thanks to the Ragnotti-Andrié crew who drove their R5 Turbo to 1st place in the Monte Carlo Rally. In September the R5 Alpine was replaced by the R5 Alpine Turbo and saw its power increase from 93bhp to 110bhp. In the United Kingdom the R5 Alpine was badged R5 Gordini due to trademark problems with the Alpine name. . In order to reach a wider market, it was decided to simplify the R5 Turbo. This operation, which brought with it a considerable reduction of the selling price, proved very positive, because the R5 Turbo II was a great commercial great success. The GT version of the A310, which made its appearance at the Salon de l'Auto, was not far behind! Thanks to its sporting and racy looks, the A310 attracted plenty of interest. In addition to the splendid victory of J Ragnotti in the Tour de Corse, nearly 60 victories throughout the world and a world championship for J-l Thérier, were credited to the Renault 5 Turbo this year..
An essential requirement for additional space due to the evolution of the manufacturing methods resulted in significant modifications to the various workshops in the factory. Engine 2.8 litres, 160bhp - 235 km/h, 0 to 100 km/h in 8s - 1000 standing start in 28s. The replacement for the R5 Alpine Turbo, the Super 5 GT Turbo was the most powerful in its class with 115bhp: Max Speed 200 km/h and 15.8s for the 400 standing start. J Ragnotti, official team driver had a program centred on the European Rally Championship at the wheel of the Renault Maxi Turbo. The new name for the R5 Turbo symbolised the maximum development of this car. Inheriting directly the 10 years of progress achieved in turbo technology on the circuits by Renault drivers and mechanics, Alpine produced the V6 Turbo to complete its range. Faster and more powerful than the normally aspirated version the vehicle made its first appearance in competition in Spring on the main European Circuits as curtain raiser for the F1 Grand Prix within the framework of the Europa-Cup. 1000m standing start in 26.8s. Alpine realised for the first time in France on an industrial scale, the cutting of polyester parts for the GTA by means of a robot using a high pressure (3500 bar) water jet 0.15 mm in diameter reaching 3 times the speed of sound. Offering a higher degree of accuracy in cutting, this process avoided the multiplication of the tools needed for different models and appreciably improved safety and the working conditions. In the same year Alpine also developed a GTA V6 Turbo to meet the American standards, in particular regarding the chassis and antipollution. The GTA V6 Turbo EUROPA CUP opened the F1 Grand Prix for 4 seasons, 1985 to 1988. To meet the standards of certain European countries, Alpine fitted the GTA V6 Turbo with an antipollution system. Initially fitted to cars marketed in Switzerland, it was later sold in Germany, Austria, Holland, etc. Year of the Bicentenary and the 35th anniversary of Alpine! This occasion was marked with the launch of an exclusive series: Alpine "Mille Miles" (Thousand Miles). True collector's items numbered from 1 to 100, these Alpines had luxurious equipment as standard: ABS braking, polished light alloy rims, special pearlescent paintwork, stereo hi-fi, leather interior. Engine 2.4 litres, 200bhp - 0 to 100Km/h in 7s - 1000m standing start in 26,8s. All the major European Alpine clubs met to celebrate the occasion. April 29th will remain a date symbolizing solidarity and devotion to the Alpine range. Presentation in 1990 of the new Alpine logo at the Paris Motor Show. The restyling of the initials symbolized the revival of Alpine and its desire to affirm its identity within the Renault group. The special edition "Le Mans" was launched in April. Meeting stringent antipollution standards and powered by a V6 Turbo engine of 2458cc with catalyst, this vehicle, thanks to its light weight and excellent drag coefficient, proved to be a particularly economic and powerful sports car. Alpine presented the A610 Turbo at the Geneva Motor Show. This new model had undergone a great deal of re-styling, particularly the front end. The chassis had been strengthened extensively but retained the central beam. Max Speed: 265 km/h, 0 to 100 km/h in 5,7s, 1000m standing start in 24,9s. The special edition "Magny Cours" version of the A610 was launched (for the French Market only) in June. Mechanically similar to the standard A610 the "Magny Cours" featured discreet and elegant interior and exterior enhancements. These included: Pearlescent green paintwork, green alloy wheels with diamond cut outer rim. chrome plated tailpipes, green "Magny Cours" decals on the doors, green "A610 Turbo" motifs on the rear windows and a special leather interior. The 50,000th Espace left the Alpine factory at the end of October 1994. Since January 1988 part of the Espace production had been relocated to the Dieppe factory. 19,000 examples of the P23 had been assembled when the P36 was launched in 1991. Renault presented the "Renault Sport Spider" at the Geneva Motor Show. An enthusiasts vehicle that conveyed the feeling of a single-seater race car but with 2 seats. The Spider was conceived with passion and commitment from the think-tanks of Renault Sport and Renault Design. Packed with innovative technology, racy and tempting with its low and squat lines and equipped with a sporting and technological cockpit similar to the Laguna concept. This small beast of car was powered by the engine from the Clio Williams and was conceived from the start for road use. All this for a price of around £20,000 and with exemplary safety features. It had been a long time since the car industry had made such a gift to those who dreamed of less conventional transport.. The year of the Spider! The car received much publicity and many accolades from the motoring press. The launch of the Megane cabriolet required the installation of a new production line. Located in the former and very compact body shop the project was a commercial success with the production of nearly 12,000 vehicles in the first year. 350 vehicles destined for conversion to Megane Rally Coupes were delivered to the Dieppe factory on 10th March. 40 were prepared for the first race of French Renault Megane Elf Rally at circuit Paul Ricard only 10 days later! After the production of more than 70,000 Espaces the last P36 rolled off the production line. Production of the new J66 (phase III) model was again entrusted to Alpine. Pioneers of the single make European Championship since 1974 (with Formula Renault), Renault have never ceased allowing young European talent to develop. As soon as the Clio Renault Sport Trophy series was announced, the Alpine factory was put in charge of manufacture and marketing of 85 examples of this racing car. Specifications included a centrally mounted rear engine, six speed sequential gearbox, racing brakes and competition cockpit. Clio Renault Sport 2,0 - 16V.Sporting and refined with its 2 litre engine producing 172bhp via a close ratio gearbox. Luxurious and well equipped. A racy design which combined sportiness and refinement. Assembly was completed in the Dieppe factory. Robots were introduced for painting. The factory was a large building site for much of the year. Following the automation of the application of mastics in April, September saw the introduction of six additional robots for the application of paint and lacquer. Intended to replace the Mégane Coupé, 450 specimens were produced in Dieppe. The shell was fitted with a roll cage, then painting and assembly followed. This new missile from the Renault marque was stripped of soundproofing and carried an autograph of the 'Master', Jean Ragnotti, in the glove compartment. In addition it was assembled in the Alpine factory of Dieppe affirming its character and specialised nature. Manufactured in the Dieppe factory, the Mégane RS inherited the 2 litre 16 valve turbo charged engine from the Vel Satis. It underwent modifications to the pistons, crankshaft and turbo. The capacity was increased and the output was 225bhp, 300 Nm torque.